The world economy is based on the sand foundation of usury, which was considered a sin and tool of covert warfare for thousands of years. The world financial system seems complex but it is actually very simple: a cabal of bankers has conquered the world by lending people and governments money that does not exist and charging interest on it. No lasting economic recovery or increased standard of living is possible for the majority unless usury and the political power of bankers are abolished. 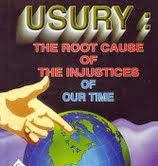 Usury is the lending of money with interest. Historically, many cultures regarded the charging of interest for loans as sinful. Some of the earliest known condemnations of usury come from the Vedic texts of India. Similar condemnations are found in the religious texts from Buddhism, Judaism, Christianity, and Islam. At times, many nations from ancient China to ancient Greece to ancient Rome have outlawed loans with any interest. Though the Roman Empire eventually allowed loans with carefully restricted interest rates, the Christian church in medieval Europe banned the charging of interest at any rate. Usury has been denounced by a number of religious leaders and philosophers in the ancient world, including Moses, Plato, Aristotle, Cato, Cicero, Seneca, Jesus, Aquinas, Martin Luther, Muhammad, Gautama Buddha. 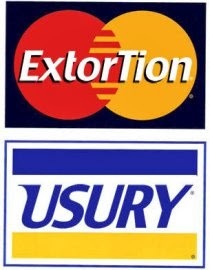 The ancient Israelites called usury "a bite." It is like the slow poison of a serpent: "Usury does not all at once destroy a man or nation with, as it were, a bloody gulp. Rather, it slowly, sometimes nearly imperceptibly, subverts the victim's constitution until he cannot prevent the fatal consequences even though he knows what is coming." Indeed, the only time the Prince of Peace became violent is when he cleansed the temple of the money changers. … Jesus went up to Jerusalem. In the temple he found those who were selling oxen and sheep and pigeons, and the money-changers sitting there. And making a whip of cords, he drove them all out of the temple, with the sheep and oxen. And he poured out the coins of the money-changers and overturned their tables. Modern churches and synagogues remain silent in the face of this great evil. And today, the money changers (high-level bankers) have conquered the world with usury as their discreet weaponry. It is the fraudulent foundation of nearly all economies through debt-based currencies issued by privately owned central banks, fractional reserve lending, mortgages, credit cards, auto loans, business loans, and IMF loans. The most powerful money changers have established think-tanks with their ill-gotten gains, such as the Council on Foreign Relations, Trilateral Commission and Bilderberg Group, which control all major political parties (The Establishment). To free the world of debt slavery and a totalitarian world government run by money changers, it is necessary to understand these frauds. Banking was conceived in iniquity and was born in sin. The Bankers own the earth. Take it away from them, but leave them the power to create deposits, and with the flick of the pen they will create enough deposits to buy it all back again. However, take it away from them, and all the great fortunes like mine disappear, and they ought to disappear, for this would be a happier and better world to live in. But, if you wish to remain the slaves of Bankers and pay the cost of your own slavery, let them continue to create deposits. -- Sir Josiah Stamp (President of the Bank of England in the 1920s). I set up a Rothbard Bank, and invest $1,000 of cash. Then I 'lend out' $10,000 to someone, either for consumer spending or to invest in his business. How can I 'lend out' far more than I have? Ahh, that's the magic of the 'fraction' in the fractional reserve. I simply open up a checking account of $10,000 which I am happy to lend to Mr. Jones. Why does Jones borrow from me? Well, for one thing, I can charge a lower rate of interest than savers would. I don't have to save up the money myself, but simply can counterfeit it out of thin air. Since demand deposits at the Rothbard Bank function as equivalent to cash, the nation's money supply has just, by magic, increased by $10,000. The inflationary, counterfeiting process is under way. To simplify, the inequity of the world’s banking system is the fact that the money borrowed from a bank is created out of nothing. On the other hand, the borrower must actually produce real goods and services to earn money to pay back the loan plus interest. When bankers create money faster than the economy grows, the purchasing power of the dollar declines which is known as inflation. The majority of the population is competing like wild animals during a famine to earn enough money to pay their debts and feed their families. A thirty-year-debt-slave is someone that has a home mortgage. First, the debtor is borrowing money that was created out of nothing through fractional reserve lending. Second, after years of making payments, the debtor may become injured or unemployed. The bank will then foreclose and sell the house. The bank will keep the proceeds of the sale and all the principal and interest that the borrower paid prior to going into default. Therefore, the borrower, who normally puts down only 20 percent (or much less) of the purchase price, bears almost 100% percent of the risk despite the fact that the bank decided to loan the other 80% (or more). Third, the cost of a home loan is approximately double the amount borrowed when thirty years of interest payments are included. For example, if a borrower with good credit buys a $300,000 house and puts down 20 percent ($60,000), the borrower will borrow $240,000 from the bankers. The interest on a $240,000 loan at 5% (a historically low interest rate) over thirty years is $223,813.88. Therefore, the total cost of the $300,000 home is actually $463,813.88 (not including property taxes and insurance). Run the numbers yourself. Those who do not pay off their credit cards each month are slaves to usury. The average Annual Percentage Rate (APR) for a credit card in the United States is 14.95%. Credit cards with APRs above 20% are common. Approximately 40 million Americans have borrowed money to attend college. The average balance is close to $25,000. Nearly 50 percent of recent college graduates are unemployed or working in jobs that don’t require a college degree and pay accordingly. Students should know that in most cases student loans are not dischargeable in bankruptcy. Paul Warburg, a partner of international investing giant Kuhn, Loeb & Company, a representative of the Rothschild banking dynasty in Europe, brother to Max Warburg who was head of the Warburg banking consortium in Germany. Senator Nelson Aldrich: business associate of J.P. Morgan and father-in-law to John D. Rockefeller, Jr.
Frank Vanderlip: president of National City Bank of New York, one of the most powerful banks at the time, representing William Rockefeller and Kuhn, Loeb & Company. Henry Davidson: senior partner of J.P. Morgan. Charles Norton: president of J.P. Morgan’s First National Bank of New York. Abraham Andrew, Assistant Secretary of the U.S. Treasury. Benjamin Strong, head of J.P. Morgan’s Bankers Trust Company. Woodrow Wilson signed the Federal Reserve Act into law on December 23, 1913. On that day, the U.S. government officially transferred its power to create money and regulate the value thereof to the world’s wealthiest private bankers. Furthermore, the U.S. government would now borrow money from private banks, enslaving its citizens with the national debt, rather than creating its own money interest free. Former Federal Reserve Chairman Alan Greenspan publicly brags that the private banking cartel is above the law and creates unlimited money out of nothing to loan its insolvent borrower, the U.S. government. David Lang, a Federal Reserve employee, admits that the Federal Reserve is a private corporation that pays dividends to its undisclosed shareholders. The head of security at the San Antonio Federal Reserve also admits the institution is private. So who receives dividends from owning shares of the private Federal Reserve? Charts created by the House Banking Committee Staff Report of August, 1976 reveal the following people and companies own shares in the Federal Reserve: Rothschilds, J.P. Morgan, the Warburgs banks, Lehman Brothers, Kuhn, Loeb & Company, Jacob Schiff, William Rockefeller, David Rockefeller/Chase Bank, and many others. A more recent study found that Bank of America, JP Morgan Chase, Citigroup, Wells Fargo and HSBC now have the power of the Federal Reserve at their fingertips. Like the Federal Reserve, the IRS was created in 1913. The purpose of the IRS is to enslave citizens by stealing the value of their labor through collecting income taxes; by force if necessary. Tax Freedom Day 2013 arrived on April 18 this year, meaning that Americans will work 108 days into the year, from January 1 to April 18, to earn enough money to pay this year’s combined 29.2% federal, state, and local tax bill. In other words, on average, the IRS and other tax collectors steal over 3.5 months of each Americans’ labor time each year. The private Federal Reserve is one of largest holders of U.S. government debt, owning approximately $1.794 trillion in U.S. Treasury securities. Much of the collected federal income taxes go towards paying interest on the national debt to the Fed for money that it created out of nothing and loaned to the government at interest. This unfortunate reality has been verified by G. Edward Griffin, Joe Plummer, IRS whistleblower, Joe Banister, and many others. In part 2 of this article, we will examine crimes associated with usury and practical solutions. Paul Adams is your humble servant and a follower of Jesus Christ.